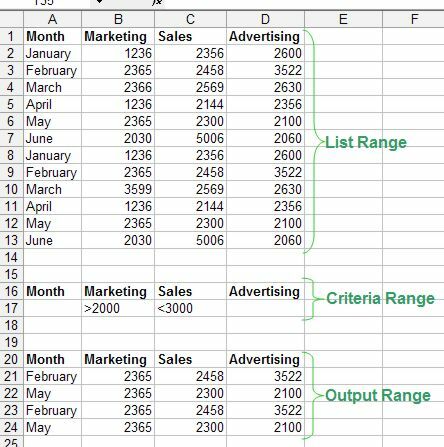 Learn step-by-step how to use the Excel AutoFilter command. Also learn how to use the Advanced Filter to suit your every needs. Learn to do an Excel filter the easy way. You can stare at you data for hours on end and still gain nothing for your time. Spreadsheet data is often not much good unless you can analyze it. If you're familiar with some of the actions that you can perform on a database, managing and analyzing your data in Excel is within your grasp. And even if you've never even heard of a database, you can still filter lists to your heart's content. Advanced Excel Filter is much more flexible than AutoFilter, but it takes some up-front work to use it. ► You can specify more complex filtering criteria. 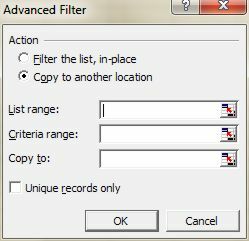 ► You can specify computed filtering criteria. ► You can extract a copy of the rows that meet the criteria to another location. 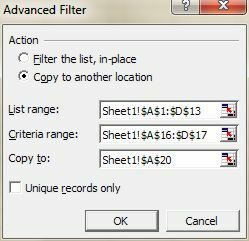 Before you can use the Advanced Filter feature, you must set up a criteria range (a range on a worksheet that holds the information (questions) Excel uses to filter the list. ► The criteria range consists of at least two rows. ► The first row contains some or all of the field names from the list. ► The other rows consist of filtering criteria. If you use more than one row below the field names in the criteria range, the criteria in each row are joined with an OR operator. The filtering involves comparisons to a value or text, using operators such as equal (=), greater than (>), not equal to (<>), and so on. ► Computed criteria: The filtering involves some sort of computation. The original database - Fieldnames + Records. Question area - Fieldnames + question(s). Answers Area - where Excel places the results. 1. Make sure your List Range has fieldnames(headings) and records(rows with data). 2. Copy the fieldnames to a new row. Type your criteria below the desired fieldname(s). 3. Choose Data ► Filter ► Advanced Filter from the menu bar. 4. Choose the option: "Copy to another location" to have your Output Range place on a separate part of your sheet. 5. Click inside the text box next to "List Range" and select your original database - fieldnames and records. 6. Click inside the text box next to "Criteria Range" and select your criteria area - fieldnames and row with criteria(questions). 7. Click inside the text box next to "Copy to" and click only the starting cell of where your output range should be. You'll see that your criteria extracts certain records from the original database and places a copy of it at the "Copy to" location.